Panadol tablets are used for fast and effective relief of headaches, toothache, backache, rheumatic and muscle pains and period pain. It also relieves the aches and pains of cold and flu, sore throat pain and helps to reduce temperature. Panadol tablets help relieve the pain of non-serious arthritis which has been diagnosed by a doctor. 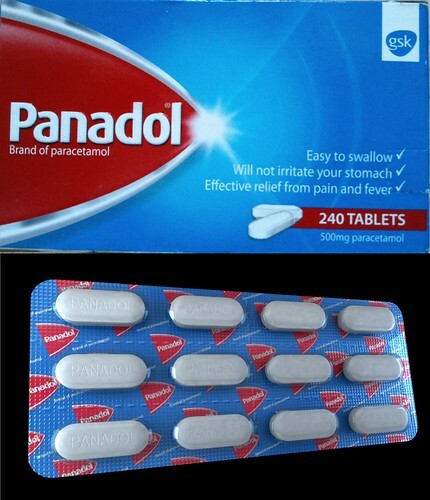 Panadol products contain paracetamol. For the relief of mild to moderate pain. Always read the label. This section contains an overview of Panadol products and does not include full label information. Mild to moderate pain such as headache, migraine, neuralgia, toothache, sore throat, period pain and rheumatic aches and pains. Relieving aches, pains and fever associated with colds and flu. I guarantee my Products are Genuine! Sealed! ■Panadol is a paracetamol formulation that contains Optizorb technology™. Adult : 1-2 tablets , 3 to 4 times daily. Children : 7-12 years, 1/2-1 tablet, 3 to 4 times daily up to 2g. Manufactured by Glaxo Smith Kline Certification.